Well around here, you might need at least three ... a greenish one for the warmer months and tanish one for the cooler months and a whiteish one for the snow periods. Maybe even a darker-ish green one for the woods. Some of the cheaper ones, I've heard reflect IR light like crazy ... so even of the critters don't have thermal, they might have NV and they might have ir-illuminators to bounce off said reflective ghille suit. Update on the Army's 6.8 round. It is starting to sound serious. Just not the surrender the whole thread to Mr. Wilkerson. But this field stripping brings back memories from 40 years ago when I was serving my time. The best blindfolded time I clocked was about 15 seconds, but that was months later in the officer school and there was a bet on. In my book the primary strength of the AK is not needing to clean it to keep it functioning. I know people that claim they've pushed 20,000 rounds through an AK without cleaning it. In my case, somewhere between 1,500 and 2,000 rounds thru a 5.56 stoner (a.k.a. an m-16) and I start to get stoppages and need to clean it. That's an impingement version. For piston stoners they will go longer, though cleaning the piston itself is more problematic. Regardless the chamber needs to be cleaned on the stoner. For the impingement guns, the bolt carrier group gets full of soot and the firing pin and bolt stop moving. That's the main issue that stops the gun. I fired my 5.56(18) all year without cleaning it until it stopped. And I took 5m to work the firing pin out and another 5m to work the cam pin out ... they were both jammed in by soot. So keeping the gun functioning after more rounds fired goes to the AK. After that we have accuracy. Now in the video the firing technique the gunny used gave him an advantage for FA firing at point blank range. But the folks I know that are AK lovers tell me the AK is great out to 300yds. My stoner 5.56(18) can hit 12 inch steel at 750yds with me shooting it off a tripod more often than not. So I would say these weapons had different design goals ... and that mostly accounts for their different strengths and weaknesses. So saying one is "better" than the other means nothing without defining what "better" means. 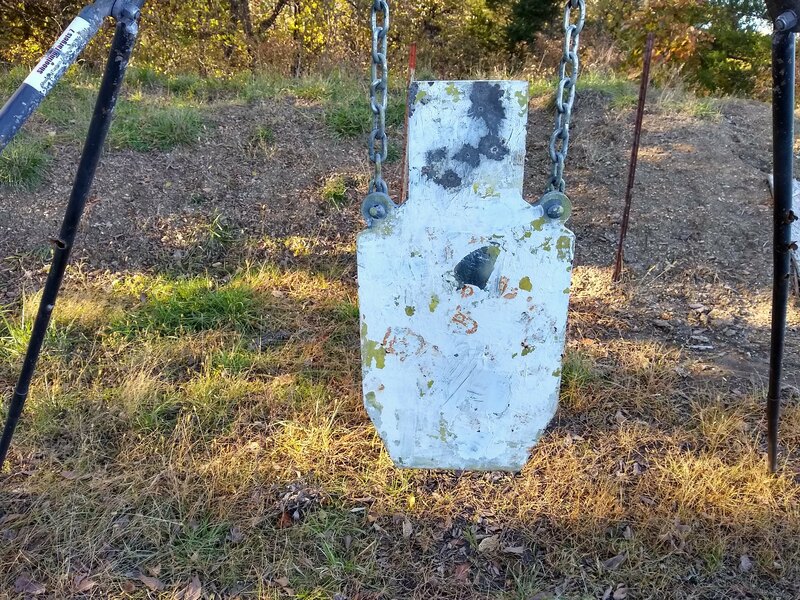 Goals: Steel face at 500yds. Environment: Clear, sunny "warm", still drying out after the big muddy. Breeze highly variable from the NW. Equipment: 7.62(22) 4x10rd mags with 5rds each FGMM 175gr SMK. NF 7-35x T3, Really Right Stuff tripod, Kestrel 2500NV. 4 wheeler. Activity: Rolled out to 500yd FP and setup. Tossed 6 tufts of grass in the air. Wind direction WNW, NW. 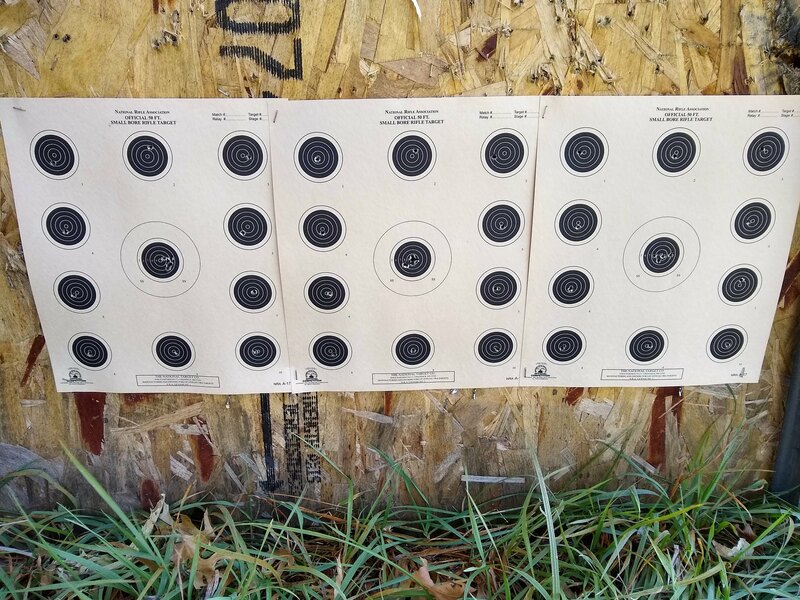 aiming at the 6x6 inch "face" of these IPSC (2/3) steel targets. Held 4 mph right and 3.1 mils up. First round high face upper right. Adjusted down left. Next 9 rounds hit also. The wind was moving me back and forth, but didn't move me off the face so I was able to adjust accordingly. Each round is a "sighter" whether a hit or a miss. 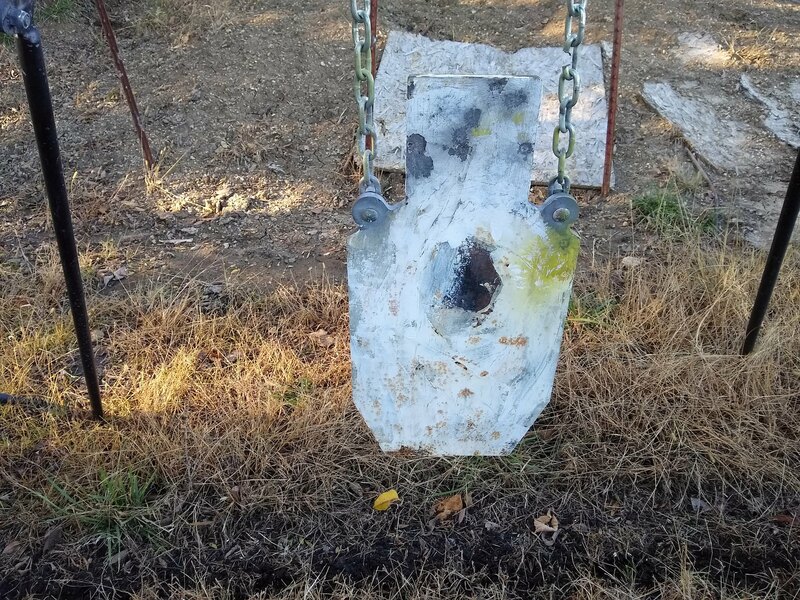 Shifted fire to the face of the steel target to the right. 10 out of 10 hits. Again wind moving me around, but not enough to move me off. At 500yds the 6 inch face is 1.2 moa target .... 6/5 = 1.2 So, the RRS tripod continues its magic to make today's shooting border line boring. Now it didn't have to be that way. The first round could've missed or I could've failed to see any miss. But as it was being able to see where every shot landed continuously improved the probability I could hit with the next shot. But the Finnish version RK 62 is pretty accurate weapon. And I understand why we chose caliber 7.62x39 weapon. If in Finnish terrain you have shoot longer distances than 100 meters, proves that you have made a tactical error. For longer distances there are better weapons. But that field stripping got bitter sweet memories in my mind. Mostly sweet. About a third of my live fire this year has been dot drills. My priorities over the six years have been about 2/3rds "fieldcraft" (as I've learned it is called) ... which is observing and moving ... in the terrain around me day and night. "marksmanship" has been a lower priority. However, this year I decided I'd reached a plateau on "fieldcraft" and wanted to boost up the "maraksmanship" aspect some more. So, the goal is to get to "1 moa" (also called "sub-moa" by some, by the end of the year. And the primary change to help achieve that goal has been "dot drills". 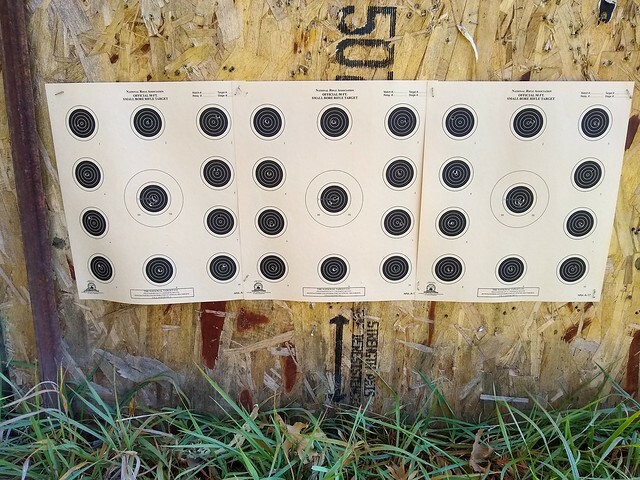 About 500rds of 7.62 and another 500rds of 6.5G .. those at 100yds and another 500rds of .22lr at 25yds. 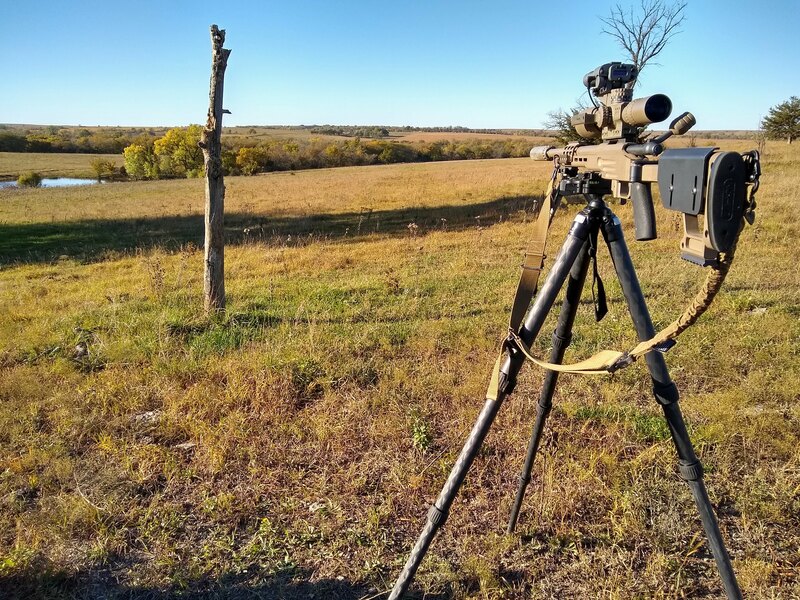 To shoot the .22lr at 25yds requires a scope that can parallax down that far. I only had one that could do it, the NF 7-35x T3. 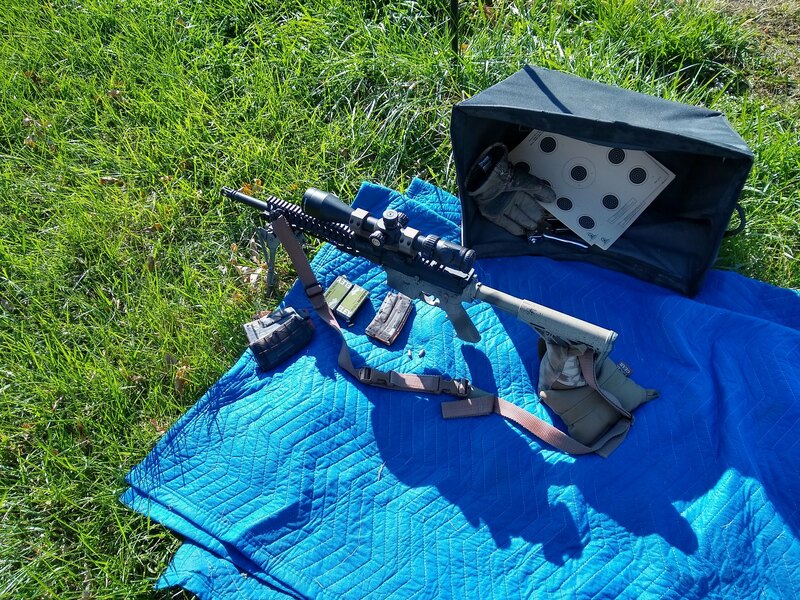 But that scope is too useful for other purposes to spend most of its time on the .22lr, so I got a crappy Athlon scope just because it can parallax down to 10yds (as can the NF). This Athlon Argo BTR 6-24x doesn't have to do much, just needs to be zero-able at 25yds. Doesn't have to track, either reticle or turrets, just has to zero (and parallax). And it does those things. So still using the Eley subsonic hollow point ammo. Which is all I shoot these days. And this is the CMMG upper. I'm using the NRA 50 foot rimfire targets. The bull, the 10 ring is 1/8 inch. There are 11 "dots" on the target. The center one is a spare, I think for "sighters" or "confirming zero" ... which is what I use it for. And I did have to adjust my windage a tad. I'm using the "pinch" trigger for these exercises. With this trigger pull, the ball of the thumb rests on the rear of the "pistol grip" and the trigger finger engages the trigger normally. So 30 scored shots on three targets max score is 100 per target. There are at least 2 ways to score, the "NRA" way and the "Army" way. Don't know how they score in the Army now, but in the army I was in you scored based on where the CENTER of the bullet struck the target, so I'm calling that the "Army" way. The NRA on the other hand scores based on the highest ring the bullet "tags" (or cuts the paper). Needless to say, the NRA way usually results in a higher score. I use both ways. I'll show the NRA score first as again, it is usually the highest. Environment: Clear, sunny, "warm" and windy. Shooting into the sun, causing some glare issues. Activity: Setup and fired three groups (5 and 8 and 6) to adjust windage. Used the spare center "dots" for that. For the dots themselves, I fired from upper left counterclockwise. Summary/Results: What is a good score ? Well, maybe 95 is the goal, that's 1/4 inch which is 1 MOA. I'm running the scope on 20x, so I can see the circles just fine. The center of the reticle was aimed at the center of the 10 ring every time, except once, when I outsmarted myself. More on that later. So, given that the center of the reticle has no problem being pointed at the center of the bull and I'm using a rear bag and I'm prone bipod, so aiming is not an issue. Trigger pull and position behind the scope are probably the two main issues. You'll notice the shots generally miss by more towards the top of the targets, than towards the bottom. And once, I tried to hold "high" for dot #10 as I thought I was consistently hitting low. Well that time, the bullet when exactly where I was aiming, I was high So better to fix the problem causing the issue than to try to hold to offset it. I think taking more time and rebuilding the position everytime helped improve the scores for the second two targets. I haven't used the "pinch" technique much, so more practice with that is in order. In fact, I'm going out to repeat this exercise now! Summary/Results: Those 8s were all shockers as the reticle was pointed at the center of the bull in each case. My only theory is I am "shadowing" the scope and can't tell due to the glare due to shooting into the sun. That said, I didn't do much different for group #3 (target #2). What did I do different. I slowed down a little more and went thru three breathing cycles while squeezing instead of two breathing cycles for targets #1 and #2. Damn! Gunny was a machine in the hip-fire full auto demo. He's the same guy from Full Metal Jacket, originally hired as a consultant. Actually, he was in trouble and improvising when he said that ... a translation would be "Oh Sh^t, we lost that round!"